Meet your guide at your hotel in the early evening and set out to explore the lava-sculpted landscapes of the UNESCO-listed Teide National Park. Enjoy the view of these rock formations, looming volcanoes and vast lava fields as you wind through the pine forests and drive through rural villages. Stop for dinner (included) in Vilaflor, Spain’s highest village, and dine at the Bodega Reverón restaurant. Indulge in some traditional Canarian cuisine, accompanied by a glass of wine, as your guide fills you in on Tenerife’s fascinating geological wonders. 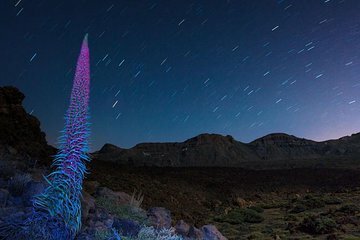 Finally, look out over the dramatic crater of Mt Teide volcano and revel in the unearthly silence and darkness of the park by night. Gaze up at the stars and listen as your guide, a knowledgeable stargazer, points out the different star constellations. If you’re lucky, you might spot a shooting star, while on clear nights it’s possible to see the Milky Way. After an unforgettable evening, your tour ends with drop-off at your South Tenerife hotel. Bring some warm clothing, especially during the winter. If any person is vegetarian or have any food intolerance please indicate it in the comment field to adapt the menu. Wonderful, take lots of warm clothes for when you are off the bus, and confirm your collection time before hand. Also let them know any dietary needs, they are very accommodating. The 1st trip was cancelled but we was not informed and when I called the office after waiting outside hotel for half hour I was told that I had missed the call, on checking my phone I had no phone calls at all. When we did get to go we went around the houses for ages collecting people from all over. The dinner at the Bodega was ok and then we went up the mountain to stop in a lay by to see the stars with no telescope. Thankfully we was one of the first to get dropped off. Star talk was good but could have had a telescope as well and maybe a colour map showing the constellations.